Are you tired of that cooking set thats been in your kitchen forever? Then perhaps some new cookware like the Rachael Ray Hard Anodized set would work for your kitchen. 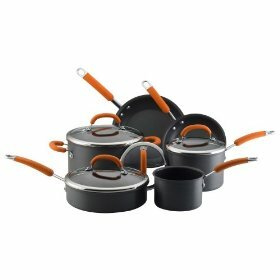 This 10 piece set of Rachael Ray Hard Anodized cookware is perfect for the starter kitchen or for updating your old cookware with a new set. This set offers the basic pots, pans and skillets that you will use almost everyday. 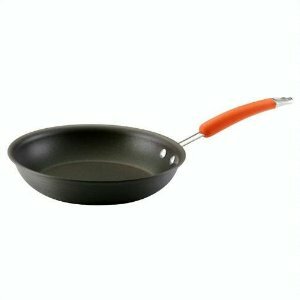 About the only pan I would get to go along with this set, would be a 12 inch or larger skillet for larger frying jobs. The exterior is charcoal gray and is made out of Hard Anodized aluminum. What is hard anodizing? It's a chemical process that makes aluminum stronger and harder, in fact it becomes harder than even stainless steel! In turn, this means hard anodized cookware has a long lifespan, stick-resistant cooking surfaces, and a finish that doesn't easily scratch or corrode. Hard Anodized aluminum also gives you even heating through out the pans with no hot spots. The rims are flared for easy and dripless pouring. The interior is also made of hard anodized material, which gives you a durable nonstick cooking surface. Allowing food to release easily and makes clean up a breeze. Are made out of stainless steel with a grippy silicone cover in orange. This set is not dishwasher safe. Hand washing is recommended. If you should get a stain on the outside of the pan due to spilled food or a boil over, clean immediately. Simply make a paste of baking soda and water, apply to the stained area and scrub with a non abrasive plastic mesh pad. Do not use steel wool for cleaning. Oven safe up to 400 degrees. These are not safe to use under the broiler. To be on the safe side always use pot holders. Hard Anodized Aluminum cookware is suitable for glass or ceramic cooktops. Using this cookware may leave metal marks and/or residues on your stovetop that appear to be scratches. Limited lifetime warranty against defects in materials and workmanship. What is not covered under warranty: Scratches, stains, discoloration or damage caused by the use of cooking sprays or overheating. The warranty also states "damage caused by accident, misuse, abuse, commercial use or incidental or consequential damages is not covered". Do not use metal utensils they will scratch the finish. The use of metal utensils that cause scratches and peeling will not be covered under the warranty. Use either wood or silicon utensils. Rachael also has a line of nylon utensils. The lids are made out of tempered glass with an attractive stainless steel rim. The lid handles features the same silicone grip that the handles have and give you plenty of space from the lid itself for safe lifting. Glass lids are great for monitoring your food while you are cooking, without having to lift and release the heat and the moisture. Cooking with high heat is not recommended, it causes the pans to warp and damages the nonstick coating. Cook with low to medium heat. Do not use nonstick sprays, they will create a invisible buildup in your pan causing the your food to stick. Oils are really not needed for cooking. If you do use oils for added flavor only use olive oil or peanut oil. Vegetable oils could leave a residue affecting the nonstick surface from performing as it should. The outside of the pans are rough, if you store these in a cabinet you might want to layer towels or paper towels between the pans to prevent scratching. This set gets great consumer reviews with a 4.5 out of 5. Pros: Buyers love the fact that all the pots and pans are oven safe to 400 degrees Another feature spoken about highly are the see-through lids so you don't loose flavor by having to open your pans frequently. Numerous reviews commented on the price be so reasonable for hard anodized. Other reviews that we read said that they love that the pots and pans are light weight. Cons: The handles are bolted on with two small bolts, making it somewhat difficult to clean around. A few reviewers complained about the interior surface flaking.